It’s the most wonderful time of the year! 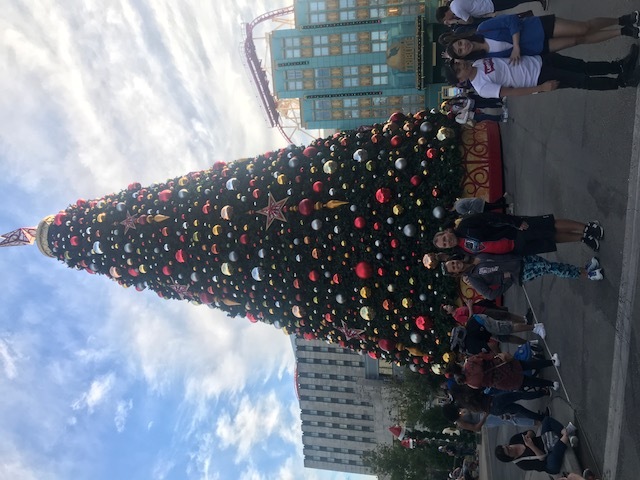 That’s right, it’s Christmas time which means the theme parks in the Orlando, Florida area are going all out to bring you a fun filled holiday season. 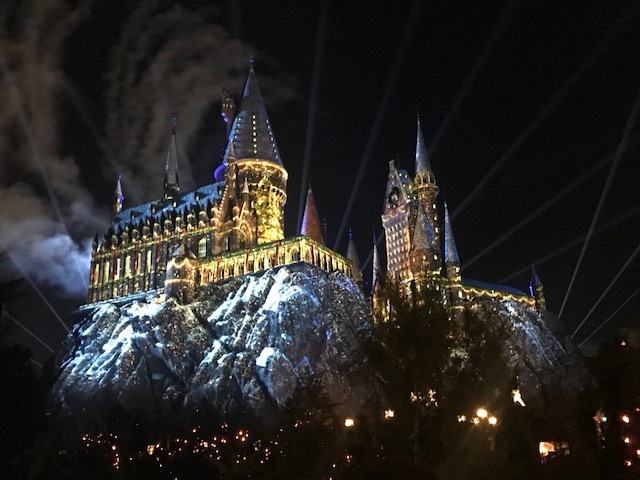 We thought it would b e a good idea to give you the breakdown on what you should attend at Universal Orlando from now thru the first week of January. So good news to all of our fellow Casual Runners heading out to Walt Disney World for the 2018 Marathon Weekend this will still be going on throughout Saturday January 6th, 2018. 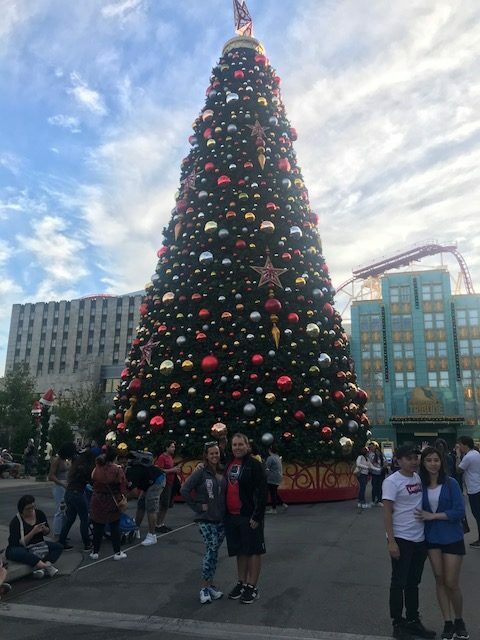 So make sure you schedule sometime into your trip if you can, to see all the holiday fun happening at Universal Orlando. Make sure to check out all your holiday must dos at Disneyland and Walt Disney World. What is Christmas without the Grinch Who Stole Christmas? 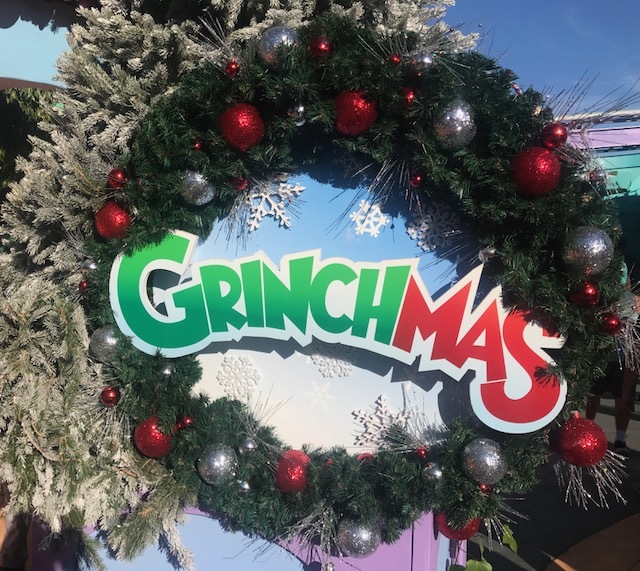 Universal’s Island of Adventures features a 30 minute retelling of Dr. Seuss’ How the Grinch Stole Christmas. The version of this show is much more similar to the live action movie over the animated classic. 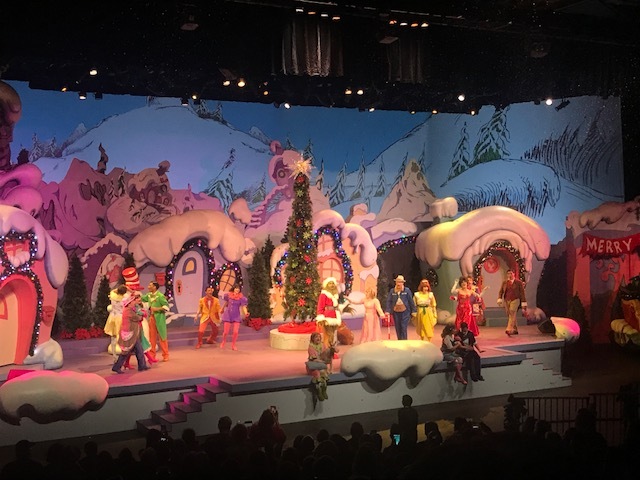 There’s also singing throughout the show of everyone’s favorite holiday classics. This is a show to not be missed! Make sure you get in line about a half an hour before the show starts because the theatre does fill up. Also make sure to head back to Seuss landing once it is dark out because it is decorated beautifully for Christmas. We weren’t sure what to expect with the parade. There were several mixed reviews of past parades, but we went into it with an open mind. Spoiler… this parade is amazing! One of the best parades we have ever seen. We had been at Disneyland a few weekends prior and we thought this parade was one hundred times better. 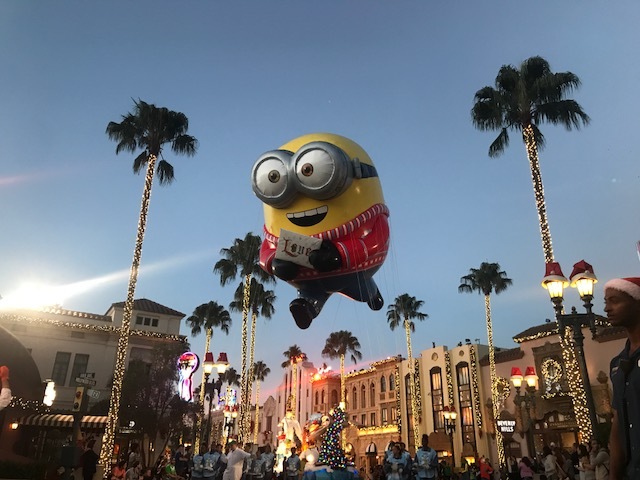 The parade features Despicable Me, Madagascar, Shrek, and of course Christmas classics such as nutcrackers, toys, and the one and only Santa Clause. All of the floats were very well done, especially the Despicable Me one. However, the highlight of this parade are the giant balloons that would be seen in the Macy’s Thanksgiving Day parade. 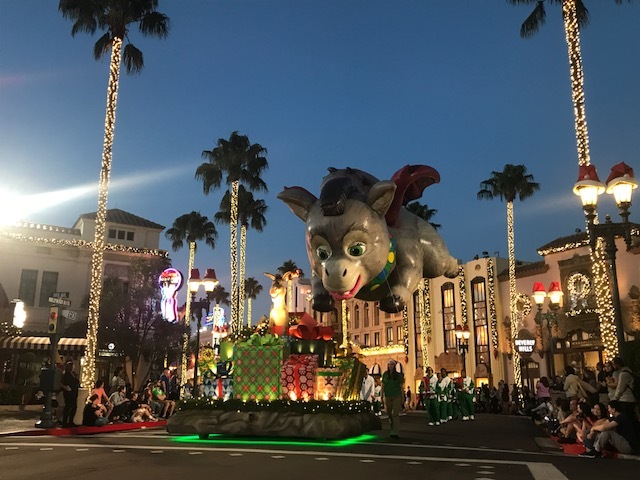 By far the Donkey/Dragons in their Christmas attire were the most adorable balloon of the parade! We grabbed seats on the curb about 30 minutes prior to the parade starting and they were excellent and we were able to sit the whole parade without being blocked. We may be a little impartial to Harry Potter, so this is what we were looking most forward to. 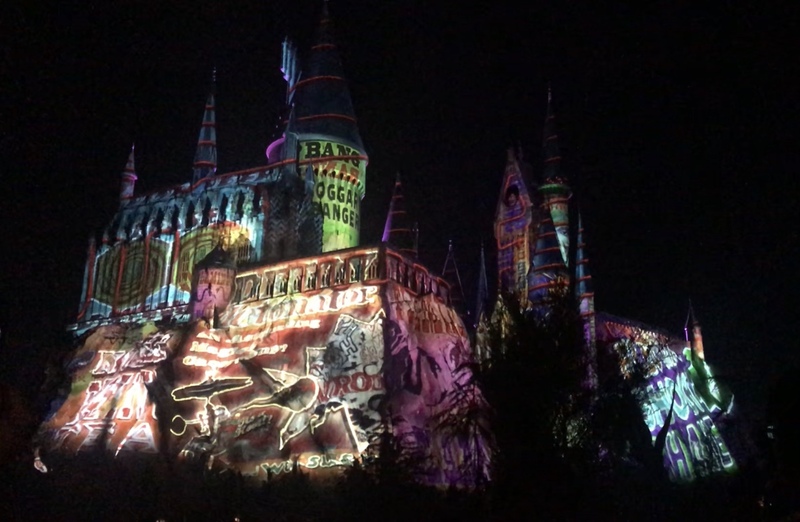 With Christmas being such a big part of the books/movies we could not wait to see how Universal was going to interpret it. 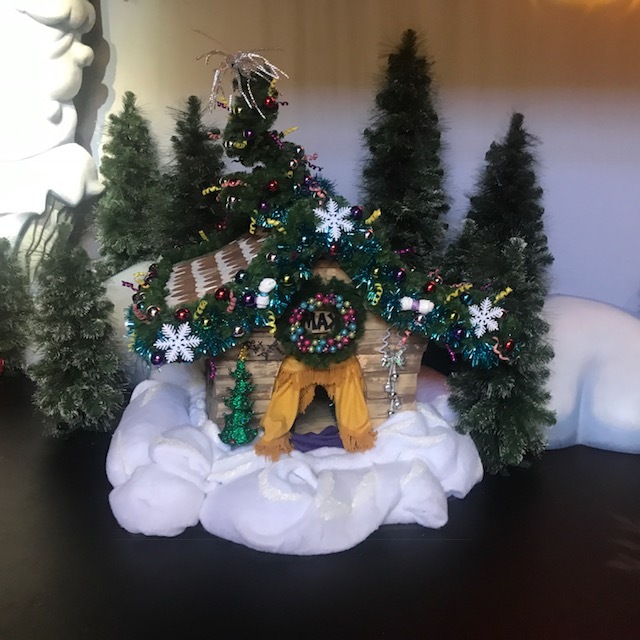 During the day both lands have very simple Christmas decor. Basically greenery on buildings, nothing too over the top. However at night with all the lights in the greenery it looks like the most adorable decorated town you could step foot into. 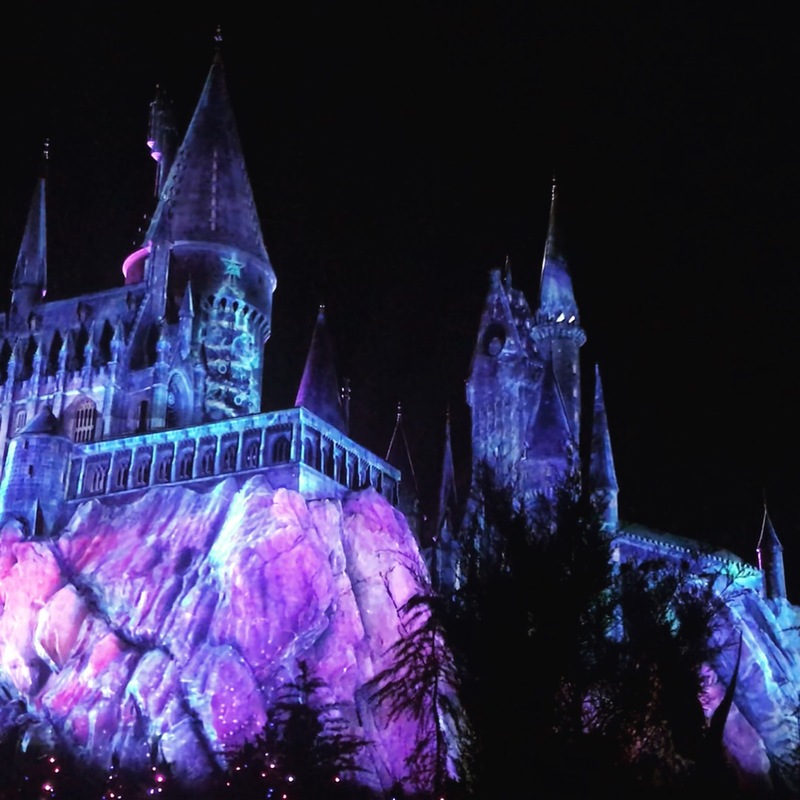 The highlight of Christmas in the Wizarding World is the lighting of the Hogwarts castle. There is an approximately 10 minute projection show that takes place on the castle every 20 minutes to the music from the movies. It is one of the most magical things we have ever seen. 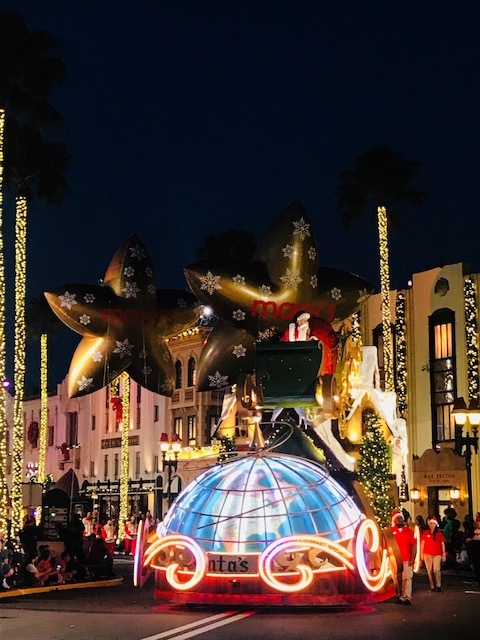 We don’t want to give too much away, but make sure you look around you during the show because the lights change throughout the land with the show. This was a very crowded show. Before the show they will hold the crowd waiting to see the show, back by the Hogshead while they clear out the previous show. If you don’t have a great spot for the show you get in for, hang around and move up to the front when the crowd clears out before they let the next group come forward. New this holiday season Butterbeer is being offered at night. Mike thinks this is by far the best of all the Butterbeer offered.